Stratimirovic invited prominent and inspiring professionals from the fields of art, architecture, design, literature, film, theater, and photography to share their thoughts on the phenomenon. 109 surprising and beautiful texts, poetic and personal visions, memories and descriptions became Praun and Stratimirovic’s raw material in their extensive work towards creating a complex narrative. Each text, interpreted in its own individual graphic form, stands by itself, but the carefully chosen order opens up another dimension where the texts start to engage in a dialogue with each other. Together they ebb and flow between light and darkness. 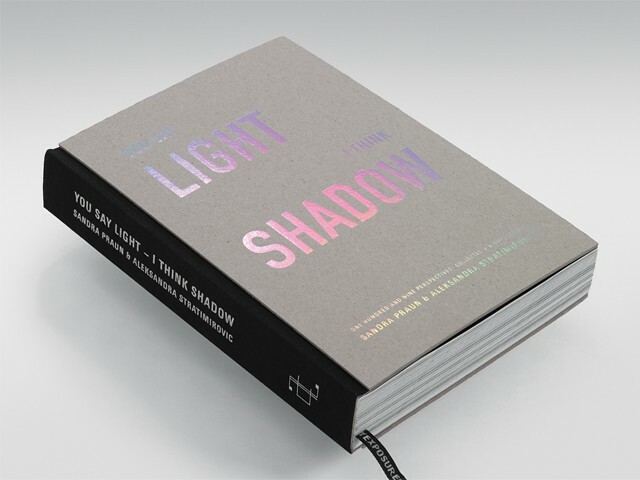 Without a single image the book is still an utterly visual experience; the words on the page come alive through the choice of graphic elements, typography, paper, and a multitude of different print and bookbinding techniques.